What is recommended for a Shed Foundation? We recommend making a gravel base 2 feet wider and 2 feet longer than the size of the shed you buy. This gives you a 1 foot perimeter to help prevent dirt from splashing up on the sidewalls of your new building. We recommend a 4" to 6" gravel base of either #67 stone or clean crusher run. 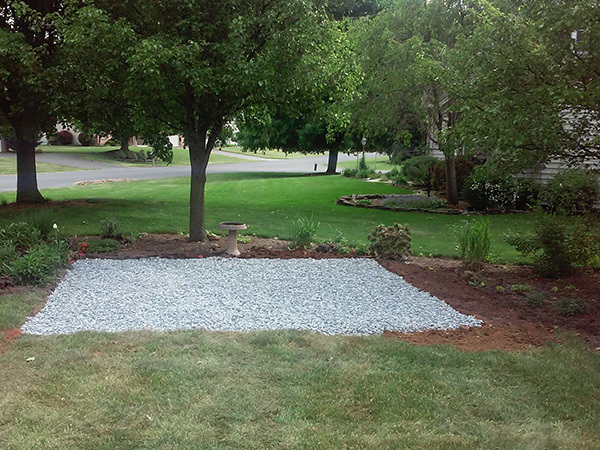 Remove topsoil and replace with gravel flush with surrounding terrain. Ask about the Timber Mill Shed-Site-Done-Right. 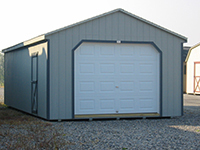 We'll handle the shed foundation and remove the hassle of making your own. Wouldn't concrete be a better foundation for a shed? This is a question we get asked occasionally and yes, there are certain circumstances where you may be better off with a concrete pad. Most of the time gravel is better. A concrete slab is going to be more expensive than a gravel pad, but this is not the only problem. Water will splash on a concrete pad and wet the doors and sidewalls of your shed. A gravel pad will let water drain through the foundation. If you go the concrete route, be sure to install gutters on the building to direct water away from your concrete. Make the concrete 2" less than the size of your building so driving rain does not collect water under the shed. What if it is not level? The shed foundation is a very important part of your shed. The foundation needs to be flat and level for the doors to open and shut properly. Our delivery driver is not an excavator, and he is not equiped to fix your shed pad. 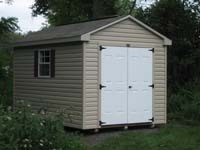 If your site is not flat and level it will void the warranty on your shed. You must check to see that the shed foundation is level. Use either a bubble string level or a transit. You will want to make sure it is level from front to back, side to side and from corner to corner. This is probably the most overlooked issue when it comes to preparing your own pad. Many people will look it over with the eye and think it looks pretty level without checking. Don't make this mistake! After the shed is delivered it is nearly impossible to fix. What if I want to save money and just put the shed down on blocks? 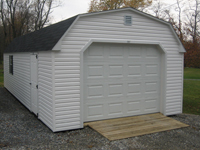 We do not warranty sheds placed on blocks due to settling issues and lack of support. 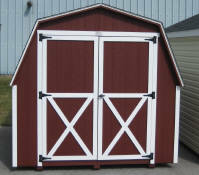 If you still want your shed on blocks and if your shed is 10x16 size or smaller we will place the shed on your blocks. You will need to provide the blocks and have them laid out prior to our arrival. You may need to do additional shimming after we leave so the doors open and shut properly. Timber Mill storage sheds are built with pressure treated 4"x4" runners and 2"x4" floor joist upright and on top of that is a 5/8" floor. The shed floor is over 7" off of the ground which provides good air flow under the shed. Blocks or gravel piled on top of topsoil will raise your shed higher, making it more difficult to get things in and out of the shed. 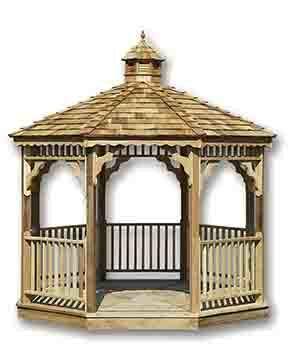 Purchase the Timber Mill Shed-Site-Done-Right option. We will handle the shed foundation and make sure it is done right. 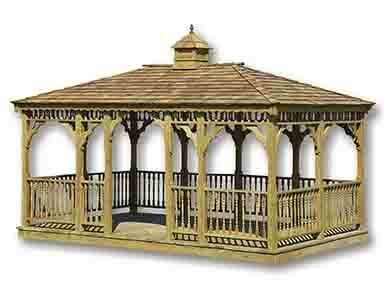 Place a quality Timber Mill Storage Shed on a Shed Site Done Right, and we know it will last.